Some parents have been asking about work for over the holiday. Your child should definitely read something every day. I will be sending several books home with them today. I am not assigning any homework (I’m not going to be doing any work other than reading so they shouldn’t have to!) But… If you want to do work, I can recommend the packet below that you may purchase yourself for $9.00 US dollars. Just click on View details and it will take you to the Teacher pay Teacher site where you can buy it using a credit card. 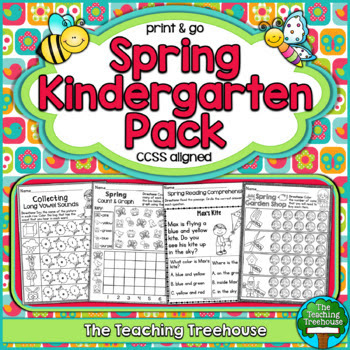 After you purchase it you can download it and print only the pages that you think your child needs to practice. It has many of the same skills we are currently working on, all based on the Common Core Standards. I wish you all a wonderful, safe holiday. I look forward to seeing everyone back healthy and happy on Sunday, April 14th! What a lot of fun we had yesterday, counting to 100, jumping for 100 seconds, eating 100 snack items, eating a cake shaped like the number 100, writing about 100…. We will continue in math next week counting and finding patterns within the hundreds chart and being able to identify and find numbers on the chart. I will be sending home a 100’s chart for the weekend. You should ask your child to show you some patterns on the board. Call a number and ask them to find it. If they find this hard, try working with numbers only until 30. If they are able to easily find a number, try asking them to show you a number before or after a given number, if they are able to do that, ask them to find a number 5 or 10 more. Remember, all children learn at different rates and you should only be concerned with what your child is able to do. Have fun with it! Please send the chart back on Sunday. Please see all 4 sight word lists below. Please remember that not all children are ready for list C and D. If you are unsure of what list your child is currently working on, let me know and I will send you a DOJO message. It is important to remember that all children are different and it does not matter what list your child is on. This is between you, me and your child. It is not something that needs to be shared with everyone. We all need to celebrate our child’s accomplishments! What a great looking group. Thank you for your support, the children look fantastic. It was nice to see so many of you this morning. I look forward to seeing you on Sunday or Monday of next week. If you haven’t signed up for a time, be sure to do it right away. I hope you are well and you enjoyed the windy weekend. It was a great day to curl up with a good book. The 100th Day is quickly approaching. Be sure your child is counting out 100 small things. They can bring them to school whenever they are finished. You are also asked to send in something for the snack (this is not counted out, just send in the whole box or bag). Thursday you received a note about the storybook character parade on this coming Thu (March 7th). I hope you’ll be able to come and watch. It will be on the playground at 8:00 am. Don’t forget to get online and sign up for a student-led conference time for you and your child on March 10th or 11th. I look forward to seeing you and your child learning together and having them show you all the great things we do in KG2. There will also be a book fair in the lobby on those days. Please click on the link below to read our weekly newsletter. Thanks, please let me know if you have any questions or concerns. We have a lot going on over the next few weeks, so I thought I would send you a list of upcoming events for you to put into your calendar, so you and your child don’t miss any of the great things happening in KG2. Attendance: If you are late, you no longer need to go to reception for a blue slip, just bring your child directly to the classroom. I do ask that you try your best to be on time as I will have to stop my instruction to enter your child into the computer. I have completed all of my reading assessments. I am working on making my guided reading groups. We should be ready next week. I will be sending home a letter at that time to help you understand more about how this works. The most important thing for you to remember is that all children are different. You need to be proud of your child where they are reading and not be comparing them with others. If you have any questions or concerns about their particular level, please come to me directly. No School Sunday, February 24th. Sports Day Wednesday, February 27th 12:30-3:00. Your child should wear a red t-shirt or their uniform PE shirt, PE shorts, running shoes, a hat and have their water bottle. We will be out on the field participating in lots of fun games. You are welcome to come and watch!! Don’t forget your camera! Sunday, March 3rd 2:15. Parents and popcorn. Come and read a story with your child. All parents are invited! Storybook character parade Thursday, March 7th 8:00 am. Dress as your favorite story book character. You can come and watch if you would like. Student led conferences will be held on March 10 and 11. You will receive information about signing up for you and your child. The 100th Day of school is on March 13th. You will receive a letter tomorrow explaining how they will need to make a collection of 100 things and bring an item for a snack. Spring break begins on Thursday, March 28th (half day). School will resume on Sunday, April 11th. Wow! We’ll be ready for some down time after all this!! Please click on the link below to see what’s happening this week in KG2. I hope you and your family are staying healthy and had a nice weekend. We finished with the MAP testing last week. I will let you know when the results are available for you to look at. We also finished the sight word assessments. I am really pleased with the progress most of the children have made. Please continue to work on the words missed or the new list that was sent home. This week I will begin the reading assessment. This will take me awhile as it is done individually and it is a new program for UAS this year. Once I have completed my testing I will let you know what level your child is reading with guidance. After I have all of my data I will begin my guided reading groups which means your child will start bringing a small reading book home most nights. I will send more information home on this when they begin bringing books home. Please read the newsletter to find out what else is happening in KG2 this week.